While building a business, you might have certain secrets and confidential information with you that you have to share with your partner, employee or any other person. This confidential information needs to be protected from getting leaked to protect your business. A confidentiality agreement form is the right type of document that protects your business from going into the wrong hand. It is signed between two parties who share common confidential information about a business and thus build a business relationship long term. If you have to share your business’s secret information with your trade partner, then get a Non-disclosure or confidentiality agreement signed and maintain the privacy of your information. Here are a few of the Agreement Forms that can be utilized. 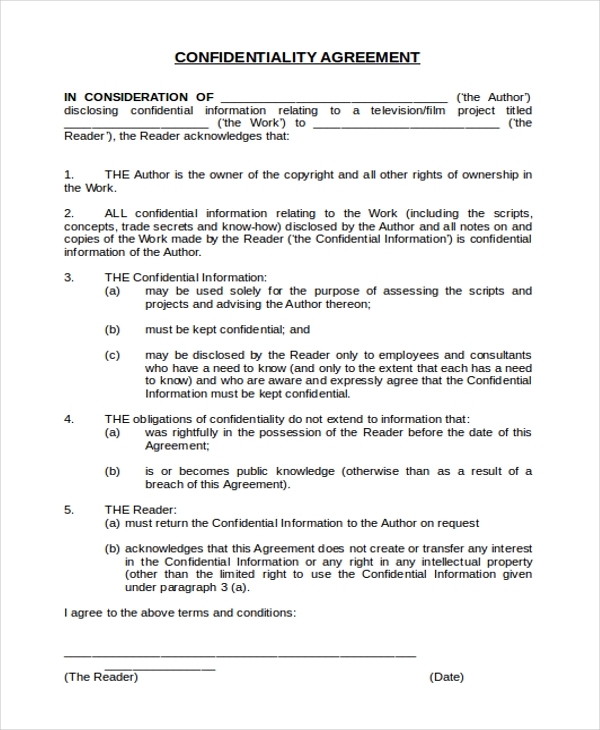 Here is a short confidentiality agreement sample created in word format to help businesses protect their secret information from getting disclosed. You can edit this format and add the certain things that you find necessary for your business. 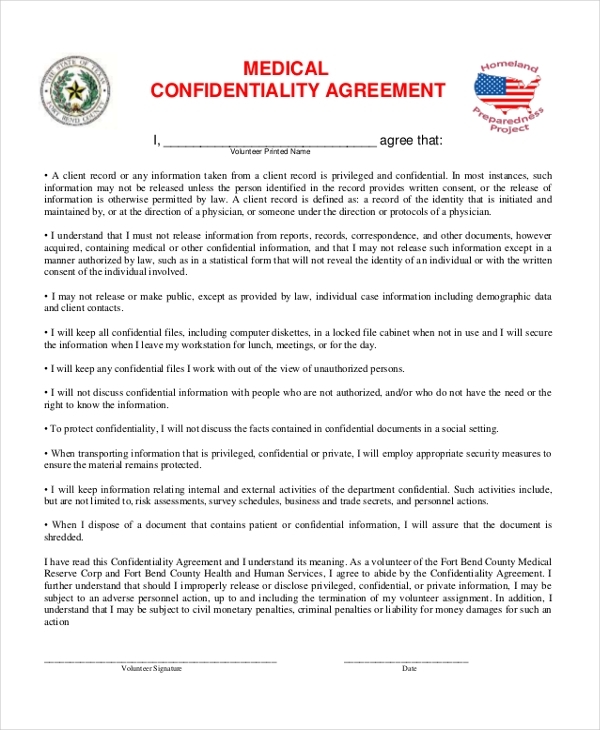 Check out this another non-disclosure agreement form created in PDF format that can be printed easily. This agreement consists of a large number of clauses covering a wide variety of points to secure the secrets of business. You may also see Consignment Agreement Forms. 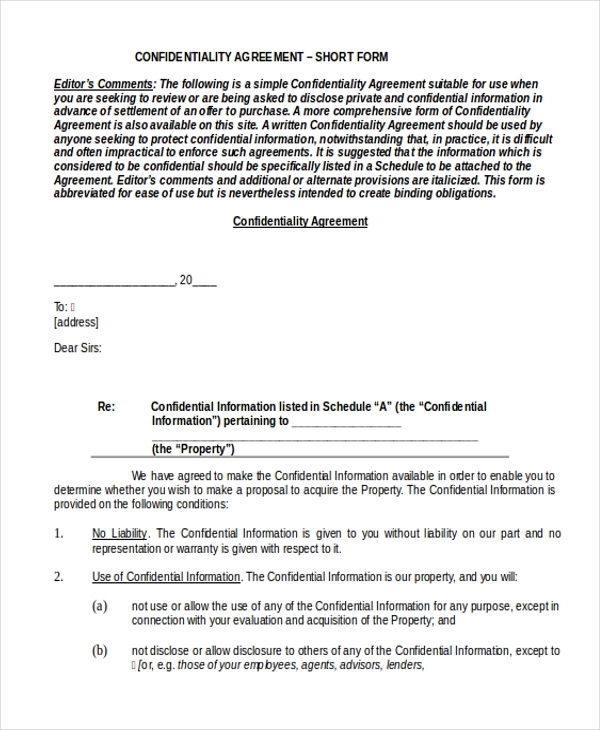 Try this generic confidentiality form ideal for any kind of business. Utilize this form to keep your confidential information secret and abide your partner in the complete non-disclosure rules. Download now. Medical confidentiality agreement information is ideal to be used when all the records of the patient, worker records, working information, budget and other information data are considered as secret information. This format is in PDF format and can be customized as per requirements. Try this employee confidential agreement when you have an employee in your organization who is supposed to keep the most confidential information about your business. This format is in PDF format and can be downloaded instantly. You can also see Land Purchase Agreement Forms. 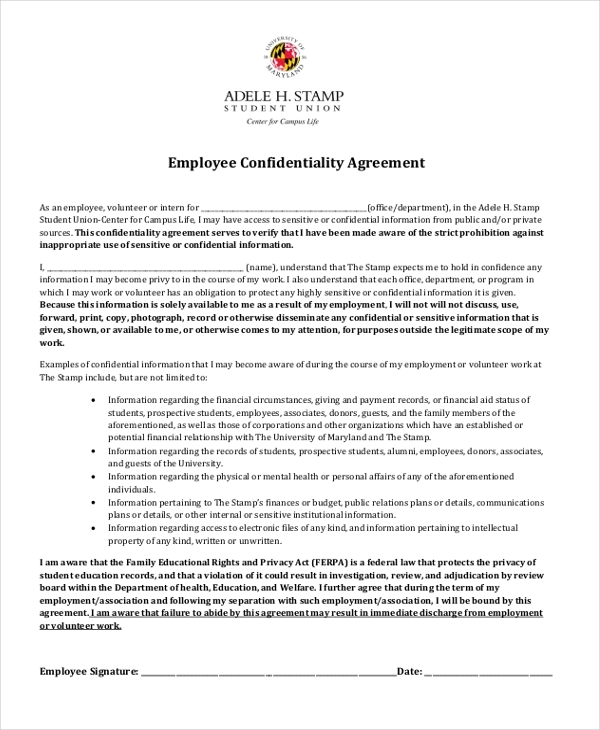 Here is another confidentiality agreement form template created in Word format to help businesses get the non-disclosure agreement signed to protect the secret information of your business from getting leaked. 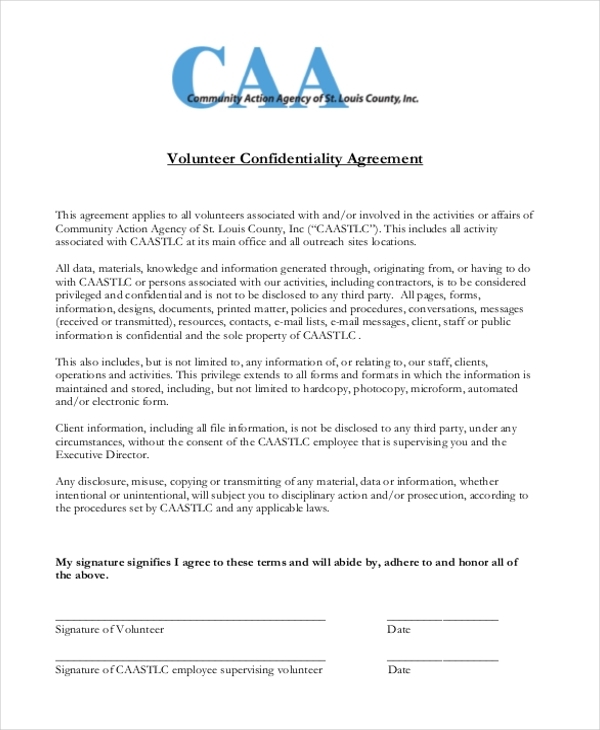 This volunteer confidential agreement form is ideal to be utilized when you have admitted certain type of data to your volunteer. This volunteer confidentiality agreement helps to safe keep your business information and protect from getting into wrong hands. 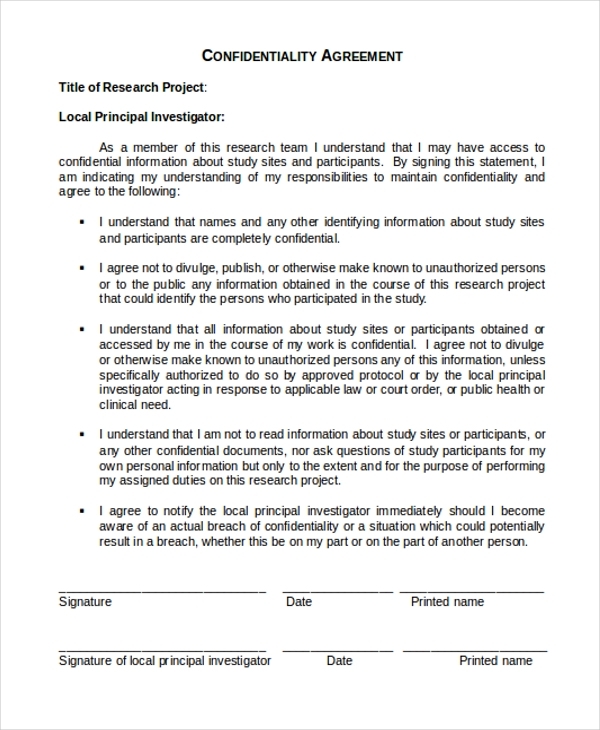 Get this student report confidentiality agreement downloaded online if you want to secure the student reports from being publicized. This format is available for instant download in PDF format. You can get it customized as per your particular requirements. You may also see Landlord Agreement Forms. 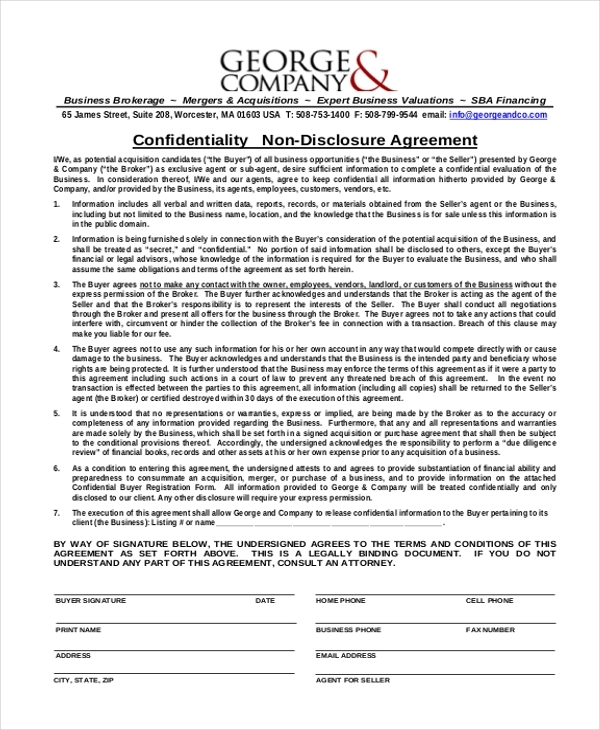 Check out this confidentiality agreement request form and get downloaded in you want the other party not to disclose the confidential and information of higher secrecy with anyone. Get this word format downloaded online. 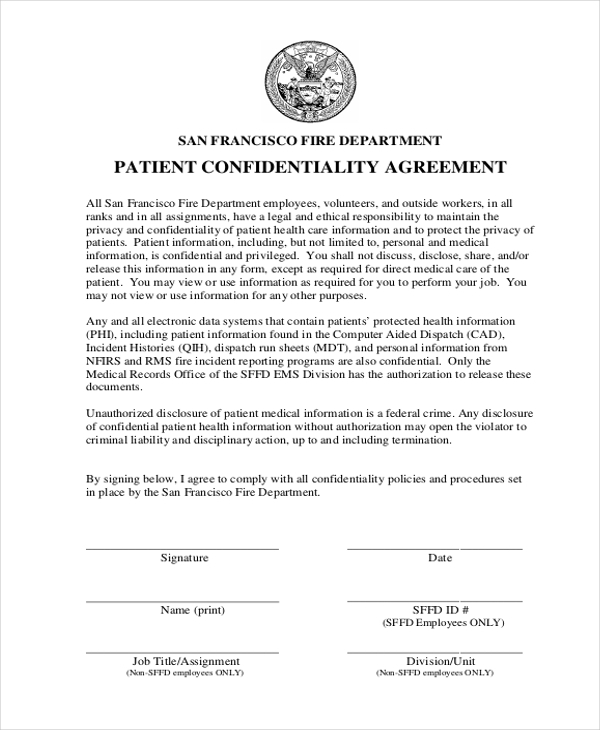 Protect the personal as well as medical information of any patient from being disclosed to anyone by your medical team by getting this patient confidentiality agreement signed. Available in PDF format that you can customize as per preferences. Why is Confidentiality Agreement Form Important? Businesses or any other working organization or authorities often come across certain situations when they have to share confidential business information with another party, personnel or partner for the sake of business development. In such situations, a confidentiality agreement form helps protect the privacy of a business or organization. This form is important to be utilized to make sure that the people you are taking into confidence don’t share your secret business information outside. This document abides all the signing people legally to protect your secret business information from getting into wrong hands. What Information is Required to be Added to a Confidentiality Agreement? There is a set of information that needs to be included within a confidentiality agreement to make it perfectly valid and effective. Below is the information that needs to be added to it. The effective date of start of the agreement needs to be specified to an NDA. The names and address of the parties also need to be included in the agreement. The types of business of the parties also need to be added to a confidentiality agreement. The reason for disclosure of the confidential information needs to be specified within this document by the disclosing party. Confidential information that needs to be protected is also specified in this Non-Disclosure Agreement Forms. Are you going to disclose your highly secret business information with your business partner, any employee, worker or any other party? Then you definitely need a Confidentiality Agreement Forms to be signed by all those persons so that confidential information about your business and work cannot be disclosed in any way.